Free-standing inflatable awning for campervans and small motorhomes. The Travel Pod Action AIR has a large living area with removable clip in groundsheet and optional 2 berth inner so it can increase living and bedroom space. This drive-away awning connects to heights from 230 to 295cm so fits to large vans such as Ducato / Boxer and Sprinter conversions and high top motorhomes with awning connection height from 230cm up to 295cm. Because it's an inflatable awning, the Travel Pod Action AIR can be set up by anyone whatever their practical skill, using the manual pump provided, or the job can be made even easier with the optional 12V inflator. With only 2 main beams you have it set up in no time and the external inflation valves give easier access than other brands of inflatable awning. This top quality campervan awning is made from superior 150D Weathershield polyester and features large panoramic windows with internal curtains for privacy or all round light. 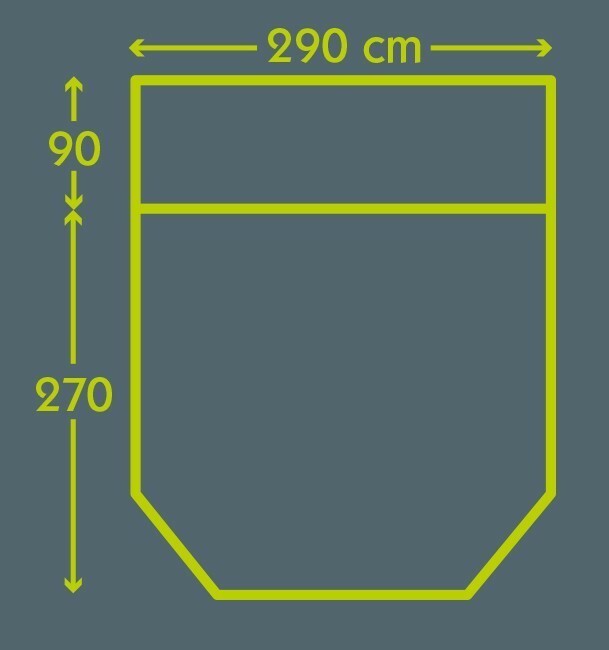 The overlapping, clip-in groundsheet excludes drafts and water, or can be removed for sites which require a breathable groundsheet. The large rear door allows the awning to be opened up when connected to your van providing a spacious living area, but the tunnel can be tied back and the awning sealed to keep your gear safe and dry when disconnected from the van. The connection tunnel between the awning and van has a direct entry side door and the awning front door is covered by a large protective canopy to keep out the elements. The type of connection to use depends on what attachment is already on your van. To fit to caravan channel ('C'-rail) purchase Drive-away connection kit. Supplied with clip-in groundsheet, manual pump, pegs, instructions and oversize carry bag. Optional 2 berth inner tent, electric inflation pump and awning connection kits available.